Stan Mikita spent his entire NHL career with the Chicago Blackhawks. During his tenure with the team, he earned numerous awards, including two Hart Memorial Trophies as the league's most valuable player. Mikita was also the NHL's leading scorer on four separate occasions. 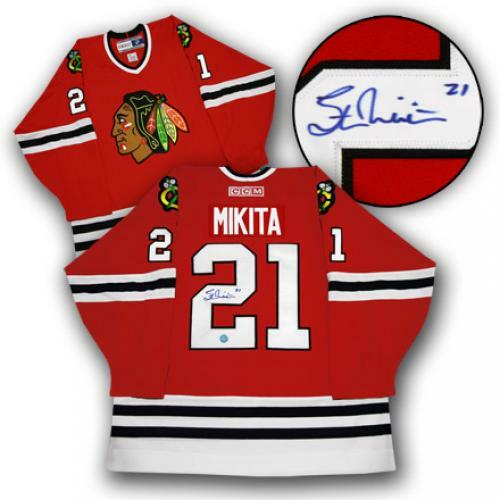 It should be no surprise that Stan Mikita cards and autographed memorabilia have maintained their popularity with collectors long after his retirement. The Stan Mikita rookie card is found in 1960-61 Topps Hockey. He also has two first-year premiums in 1960-61 Topps Stamps and 1960-61 Shirriff Coins. 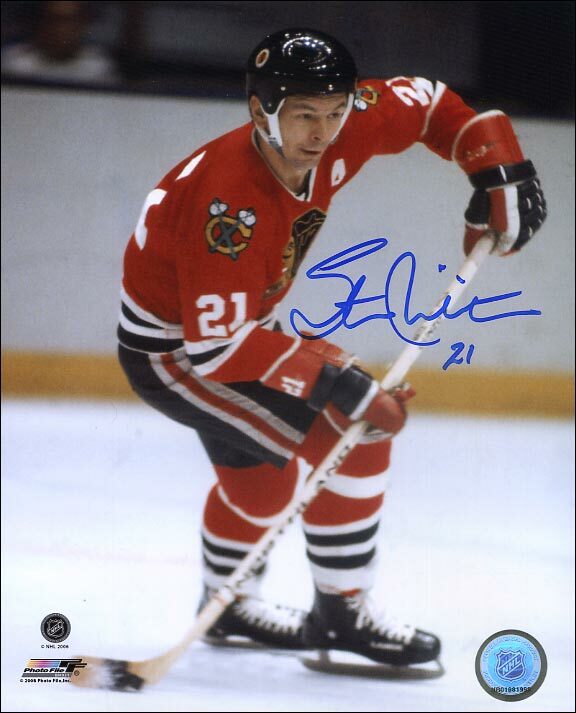 Mikita's first autograph card is from the obscure 1991-92 Future Trends Canada '72 Gold Letter Autographs set. His first autograph card issued by a major trading card manufacturer can be found in the over-sized 1997-98 Pinnacle Beehive. In 1999-00, Upper Deck produced Stan Mikita's earliest memorabilia cards as part of the Piece of History 500 Goal Club insert. Two versions of the card exist. 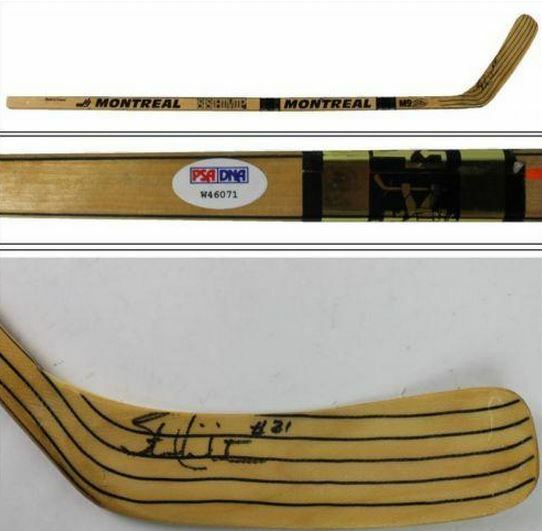 The first contains a piece of a Mikita game-used hockey stick. It is not serial numbered. The other version adds an on-card autograph and is numbered to 25 copies. As a result of his contributions to the team and the league, Mikita's hockey cards and memorabilia are highly collectible and provide collectors with a solid investment opportunity. 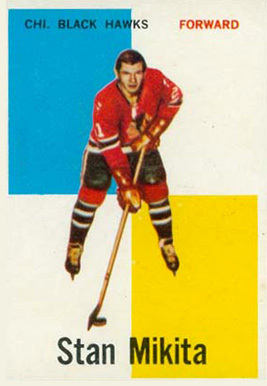 The '60-61 card for Mikita features an iconic Topps hockey design. It is instantly recognizable by collectors and has long been a hobby favorite. However, the white borders make it prone to yellowing, given its age. 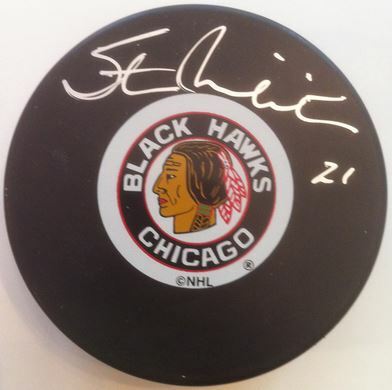 Below you will find an example of what Stan Mikita's authentic signature looks like. This can be used as a first point of reference for determining the legitimacy of autograph memorabilia, but is not a substitute for having your items authenticated by a well-respected professional autograph authentication company. Some of the trusted sources within the sports memorabilia market include the following companies: PSA, JSA, and Mounted Memories. The signature is written on a horizontal plane that exhibits a very slight rise in an angle of about ten degrees. The signature is written in an individualized cursive style script. The "S" is unique in that it is a printed version with an extra loop on both the top and bottom. The "t" contains a loop in the vertical portion which is then crossed. The "M" resembles more of a combination of a printed "C" and "L."
The "i"s are both dotted. The "t" is often half crossed and disconnected from the vertical line. The letters "k" and "a" are implied and not discernible.